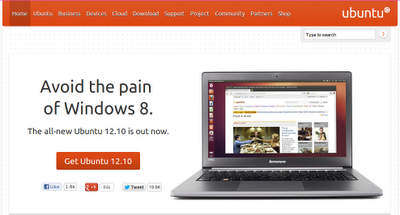 Happy Ubuntu 12.10 Release Day! It is an exciting day! We love release time at System76! Our support technician, Ian Santopietro did a nice presentation early this week highlighting all the awesome features and enhancements of the new version of Ubuntu. Most of the enhancements lie within the Unity dashboard. Animated previews, application installation straight from the dash (without opening software center- it's amazing! ), ability to drag and drop applications from the dash to the launcher and a new photo lens. There are a number of big changes within the dash. You have to see the animated previews, especially when searching videos- it's very innovative! My personal favorite feature is the Web App integration. An icon shows up in the browser when the website is available in an Ubuntu Web App. Sites like Facebook, Google+, gmail and Amazon have Web Apps so you can integrate them into the launcher like a normal application. The Amazon and Ubuntu One Music Store Web Apps are installed by default. Instead of opening in a browser, the site opens through the Web App, at faster speeds and reducing tabs within the browser. For me, this is especially awesome because I'm the type of person who has 10 tabs open in a multiple browsers and I like the look and feel of the Web App much better. Web Apps truly bring the internet closer to your desktop! All System76 systems will ship with Ubuntu 12.10 beginning Monday, October 22nd. We emailed current customers and newsletter subscribers the instructions to upgrade and a highlight of the enhancements after the release announcement today.